Recently I was asked to take a look at a customer database and make recommendations on how and which code they can improve. The deadline for the assignment was extremely tight (3 days). I had to go through just over 7000 stored procs at look at the design of 1323 tables in the process. I remembered from a while back at a SQLCape user group meeting someone recommended Qure Optimizer. I decided to download the trail version and give it go. As I like tools that make my life a bit easier so I can spend more time on R&D. What happened next was awesome. Why? Because I didn’t expect this level of detail Qure Optimizer provided. But before you start please do not run this on your live environment. Please run it against a backup of your live environment and then implement the changes afterwards with the scripts provided. Multiple workload sources: Qure Optimizer supports SQL Server workloads captured in one or more trace files or trace tables, as well as workloads captured by select 3rd party monitoring tools (in my case SQLSentry). Large workloads supported: Qure Optimizer supports SQL Server tuning with large workloads consisting of many millions of queries. Trace files up to 10GB are supported. Holistic balancing of performance benefits: Qure Optimizer tunes the entire workload holistically. When recommending any specific improvement (eg, “add an index”), Qure Optimizer considers the SQL Server performance effects of that recommendation across the entire workload, not just on an individual query. SQL Server Performance benchmark: Every recommendation is automatically benchmarked against the copy-of-production database. Qure Optimizer replays the workload, applies the recommendations, and then re-runs the workload to measure actual performance improvement. Performance metrics: For each query, the performance improvement achieved is shown via a range of metrics: Duration, Physical Reads, Logical Reads, CPU and Writes. Validation of recommendations: The benchmark also validates the functional correctness of the recommendations. For example, in the case of SQL rewrites, the benchmark verifies that the result sets returned by the original SQL and the rewritten SQL are identical. Predictive knowledge: Thanks to the performance benchmarks, the benefits of the selected SQL Server tuning recommendations are known and quantified in advance of deploying the recommendations to production. Apply scripts: Executable scripts are provided for applying the recommendations to production, selectively or in bulk. By using Qure optimizer I was able to complete my tasking within a couple of hours and thus impressing the powers that be and them hiring me as to look at their other SQL environments (Consultant dream come true). What was a big bonus for me is the fact that Qure optimizer works with SQL Sentry’s monitoring tools. As SQL Server professionals we all rely on up to date documentation from clients as a way for us to get to know their environments quicker. More often than not it is either outdated or they don’t have any, which makes our task a bit more difficult as we now have to go through their servers and databases individually which adds days to the engagements. Recently I faced this situation again but I was prepared. I have recently started using GenisiOne Solutions T-SQL Source Code Unscrambler to help me understand and document client environments within hours instead of weeks. GenisisOne is also the first partner chosen by Redgate to be part of its SSMS Ecosystem. Why I decided to use GenisisOne? The database while not big is used by their main application. And for good measure add one week to learn the environment and make recommendations on how to improve database performance … did I add no documentation? The next tab is the dependency viewer in a tabular form. It tell what makes up your object in my case I chose a view and as you can see it tells me which schema.table.collumn makes up my view. 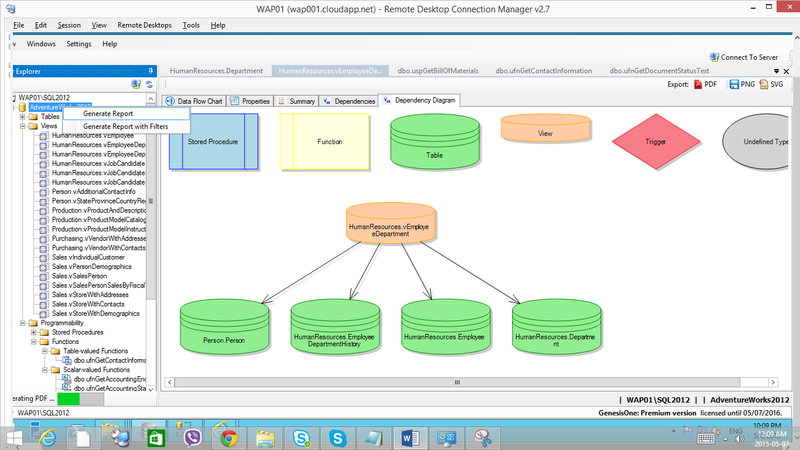 Last but not least is the dependency diagram which gives you a high level view of your object. As you can see the each colour represents a different object. On the top right hand side of the pane you have the option to export your object to either .PNG , PDF or SVG formats or if you do not want to export objects individually you can document your entire database within seconds into PDF format. To do this simply right click on the database and click generate report as shown below. After which you can now open the documentation for your entire database. I managed to finish within 5 days and make the required recommendations. 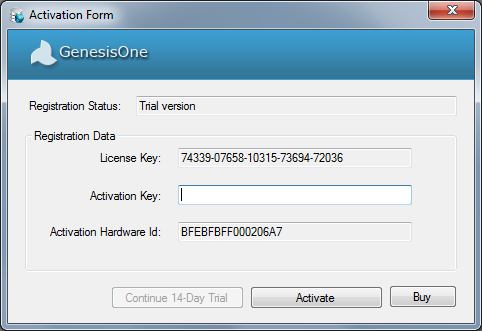 I have also asked .NET MVP Dirk Strauss (T|B) to give GenesisOne a go . His feedback “As a developer GenisisOne allows me to learn my client(s) environment fast allowing me to produce results faster. From all the tools that I have used in the past T-SQL Unscrambler is different as it is not a traditional documentation tool but a visual aid for SQL professionals. In this post I want to clarify the difference between High Availability and Disaster Recovery from a DBA point of view. If you current DR plan looks like Dilbert’s best you read this post. Disaster Recovery is the process you follow to recover your environment from scratch. A disaster can be anything from a flood, fire, power outage, explosion to a human error that affects your primary data centre and forces your organisation to run on minimum resources (not fun. Been there done that… hope not to do it soon again). Ask yourself: Do you want to stay in business? If your answer is yes then you understand why a DR and HA plan is important to the organisation. A plan doesn’t only allow others to understand your thought process but helps you recover your systems faster as you know exactly what needs to be done and can relay your message faster. Talk to your business users first. Why, you may ask? They are the ones who will give you an indication of which systems are important and what they require in order to function with minimal resources. Sit with your team and visualise your tier 1 systems (for purpose of this blog we focus on tier 1 servers). By this I mean draw a picture and put it up against the walls of your cubicle. This way you will not forget how the databases and applications fit together. You also need to include the SQL jobs (please script this out or useBiDocumenter), script out all your logins, I would recommend Idera’s SQL permissions extractor. One of the key things you require is to keep your documentation up to date. 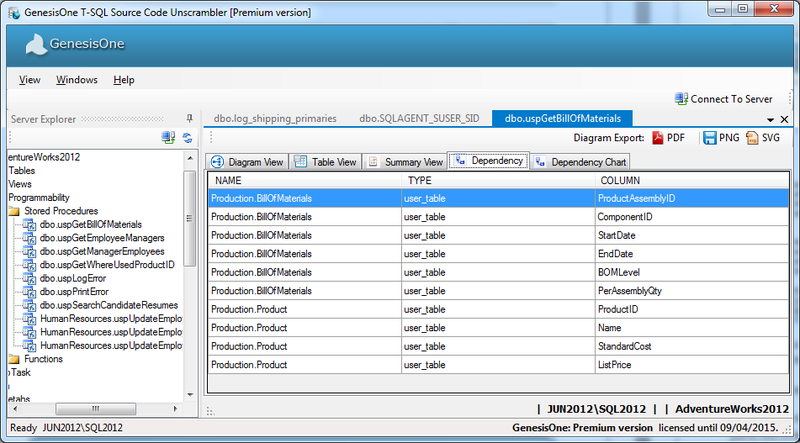 Use a third party documentation tool like BiDocumenter by Pragmatic Works. It documents the entire SQL Server stack. If all hell breaks loose at least you will be able to recover your database structures as the documentation includes all the structures and a sample of the data. Below you see such a sample. If you cannot use this software I would recommend using Red-gate‘s virtual restore. It allows you to restore databases to your local machine using minimal space (I think it was 10mb), the database is readable. I used it a few times when our production restores to our support server were running late. It allowed me to buy some time until the restores completed. Test your backups regularly, whether they are disk or tape backups. This ensures that you have a valid backup set. Remember, a DBA is only as good as his/her last backup. This will be your first step when your start the recovery process. Most organisations test the DR plan twice a year (at least the clients I worked for). This allows you to always improve the plan and to ensure that the plan fullfills all audit requirements set by your organisation’s risk management division. From my own experience: Back in 2009 our data centre got flooded and almost all our servers were taken out. Luckily my colleague and I did not panic and recovered our tier 1 database servers in a few hours. We had tested our DR strategy twice a year and for a few years we had no worries until the disaster arrived. Over the last 13 years I have performed and designed a few Data Recovery (DR) plans as well as recover systems based on those same DR plans. High availability is your top priority. As a DBA you are responsible for the design and its implementation. Many organisations use a combination of hardware and software technologies to ensure that they meet their SLA’s. There are still some people who believe that HA and DR are the same thing. They are not! In a nutshell, High Availability is the mechanism used via various designs and technologies that ensures that your applications are up when your server(s) malfunctions. It also helps IT departments to better adhere to their SLA’s. There are lots of ways to ensure the 99.9% uptime that most SLA’s demand. Hardware vendors like HP provide SAN replication software allowing you to copy the .ldf and .mdf files to a certain point in time. A couple of years ago we used the software to successfully restore one of our production systems to our DR site. It took 15 minutes to restore a system that usually took me 8 hours to restore without using the software (Happy dance). From a server side you can also look at Hyper-V, VMware, Windows failover clustering or a combination of them. This you will need to discuss with the system stakeholders and figure out which option suits you best. The best way to find out which option that is, is to play around with the various technologies and find your flavour. Always ON High Availability groups: leverages off WSFC (Windows Failover Clustering) and allows you to add your precious cargo (databases) into HA groups and fails over automatically (faster than traditional cluster). Add an AG listener and your users won’t even know which server they are using. Database Mirroring: is a solution for increasing the availability of a SQL Server database. Mirroring is used on a per-database basis and works only with databases that use the full recovery model. LogShipping: log shipping operates at a database level. You can use log shipping to maintain one or more warm standby databases (referred to as secondary databases) for a single production database that is referred to as the primary database. Replication: is a set of technologies for copying and distributing data and database objects from one database to another and then synchronizing between databases to maintain consistency. Using replication, you can distribute data to different locations and to remote or mobile users over local and wide area networks, dial-up connections, wireless connections, and the Internet. 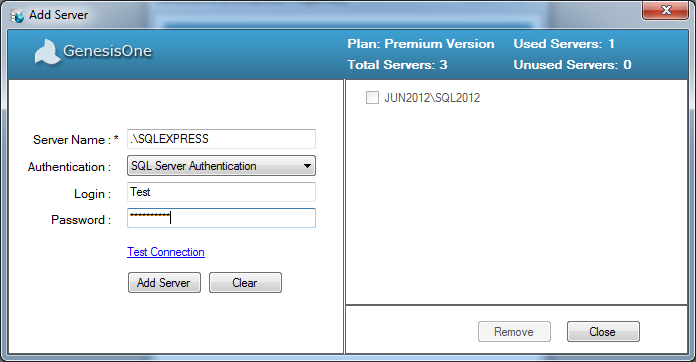 For more information on SQL Server HA options please get in touch with us. Disaster recovery is the process we follow when having to recover systems from scratch in the event of a catastrophe. High availability can best be described as the business continuity process we follow when (one of) our server(s) goes down and we need to failover automatically with minimum impact to the business users.